The enhanced driver license (EDL) or enhanced ID card (EID) confirms your identity and citizenship. It's an acceptable alternative to a passport for re-entry into the U.S. You can only use it when you cross borders by land or sea. The EDL/EID is also an acceptable REAL ID document. 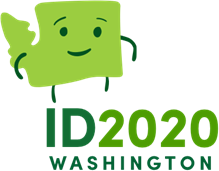 When you apply, you must be able to establish (or re-establish) your identity, U.S. citizenship, and WA residence. See Proof of citizenship, identity, and residence. For a checklist, see What documents do I need to get my EDL/EID? Enhanced driver license (EDL) At least 18 years old. Enhanced intermediate driver license At least 16 years old. If you're applying for an enhanced intermediate driver license, you must meet all the requirements for an intermediate driver license in addition to the requirements for an enhanced driver license. Applications are accepted up to 90 minutes before closing. Allow enough time to complete the process (document and in-person interview) for you and each family member. Allow 2-3 weeks to receive your permanent EDL/EID in the mail. You'll get a temporary EDL before you leave, but you can't use it at border crossings. All of the documents required for proof of citizenship, identity, and residence. If your name has changed, bring documentation of the name change. For a checklist, see What documents do I need to get my EDL/EID? Visit a driver licensing office location to apply. Appointment-only offices: Contact the office to make an appointment. Walk-in offices: Check our EDL/EID application hours before your visit. Applications are accepted up to 90 minutes before closing. Allow enough time to complete the process (document and in-person interview) for you and each family member. Proof of citizenship, identity, and residence. Your Social Security number, it's required to help enforce child support laws. It won't appear on your license. Your Washington resident address and phone number. Your height, weight and eye color. Your place of birth and mother's maiden name. A physical and mental fitness statement. Previous driver license information, if any. Suspensions, revocations, or cancellations of prior driver licenses, if any. Pass the knowledge and drive test at any driver training and testing location. Biometric identification technology to verify your identity. Radio Frequency Identification (RFID) in enhanced driver license/ID cards. Complete your interview and pay the fee. A physical description, (height, weight and eye color). Pass a vision screening and demonstration of color recognition. You won't need to take a knowledge or drive test unless you have a medical or physical condition that requires testing. Turn in your standard WA driver license. Previous driver licenses information, if any. You won’t need to take a knowledge or drive test unless you have a medical or physical condition that requires testing. Turn in your out-of-state driver license.